UNICORE provides a number of client applications, such as a Web portal, GUI client, and a command line client. Custom applications can be built as well, directly using UNICORE’s Java client APIs. The UNICORE Portal is the most recent client in the UNICORE portfolio. It enables the users to access compute and data resource through a web browser without having to install and maintain a client application on the end user’s machine. Using a straight forward navigation menu users can create and submit new jobs. The jobs view allows to view the exit code, browse the results in the working directory, search and/or restart jobs. A Data Manager view allows the user to transfer files between storages as well as create, edit, download and upload files. There is also a workflow editor to create and submit workflows, which covers the elementary workflow features. The status and data of all the user’s workflows can be found in a separate view. 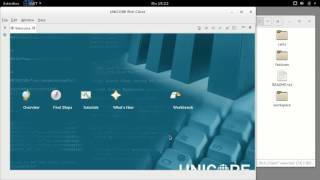 The UNICORE Rich Client (URC) is a desktop client that offers the full set of functionalities to the users in a graphical representation. It provides a useful graphical view of the Grid, which can be filtered in order to find specific resources, services or files. Detailed resource requirements for jobs (e.g. required number of CPUs, amount of RAM) can be specified. Users are enabled to design complex scientific workflows that combine several applications to automate the completion of difficult tasks. To this end, a fully-fledged workflow editor is provided. It allows for graphical programming where building blocks like loops or if-statements can be arranged with just a few mouse clicks. For a tight integration of various types of applications, the concept of GridBeans / Apps was invented. GridBeans are small software packages that provide tailored graphical user interfaces for scientific applications available on the Grid. 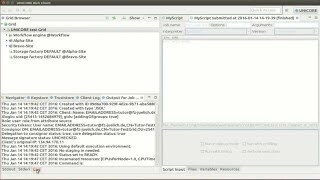 Some basic Apps for executing scripts (perl, various shells, etc.) and running single commands are available by default. New Apps can easily be developed using the respective APIs and documentation. The UNICORE command line client (UCC) is a very versatile command-line tool that allows users to access all features of the UNICORE service layer in a shell or scripting environment. It allows to run jobs, monitor their status and retrieve generated output, both in single job mode or in a powerful and flexible batch mode for multiple jobs. Additionally, workflows can be submitted and controlled with the UCC. UCC includes several data management functions. Remote storages can be listed and files can be transferred from local to remote as well as from server to server. UCC can be used for administrative purposes as well, for example to list all jobs, or to perform some clean up. An important feature of UCC is its extensibility. New commands can easily be added, and the “run-groovy” command allows the execution of scripts written in the Groovy programming language. A dedicated UCC mode for the popular Emacs editor is also available.